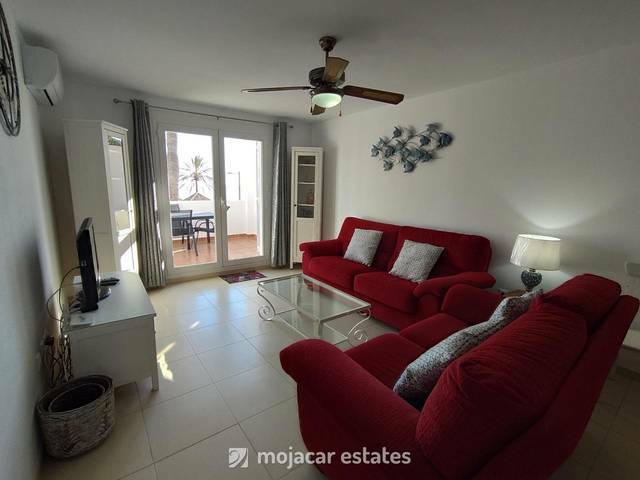 Lovely one bedroom apartment with stunning sea views in a community with shared pool located at the foot of the old village of Mojacar and 2km to the nearest beach in Mojacar Playa. Top floor apartment comprising 1 double bedroom with en suite full bathroom, open plan fully equipped kitchen, lounge with dining area and access to terrace. Air conditioning in lounge and bedroom. Terrace with table and chairs, BBQ and 2 sunbeds.